When the Moto X finally does get its official launch there won't be much we don't already know about the handset, with further leaks revealing new camera features and a possibly low price point. 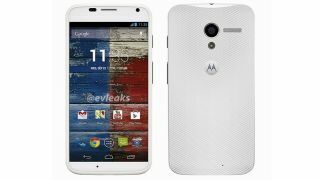 An image of the white Moto X was posted online by @evleaks - a Twitter account famous for accurately leaking phones and tablets - which seems to jive with other photos which appeared earlier this month. The @evleaks account also gave us a heads up on the Moto X's battery, claiming that it will feature a 2200mAh power pack which won't be removable, just like the Nexus 4. Meanwhile over at Android Community word's out that the Moto X could undercut the Nexus 4 in terms of price. An unnamed tipster suggested the 16GB Moto X will come in at $299 (around £195, AU$320) - the same price as the 8GB Nexus 4 - with the 32GB version potentially costing $349 (around £230 AU$375). Things may be getting more gesture-based too as another leak, this time from a questionable "anonymous tipster" on Android Police, claims to show a series of extensive screenshots from the Moto X's camera app. The snaps show swiping gestures are required access the settings menu on the left of the screen, while the swipe from the right will take you into gallery - the latter of which is already a standard action in Android Jelly Bean. That's not all. You'll also apparently be able to hold down on the screen to activate burst mode and take a rapid succession of snaps, while sliding a finger up or down the display will toggle the zoom level. Google might be treating us to some new tricks as part of the camera app with slow-motion video capture and a "twist your wrist" action to launch the snapper. We may be waiting until October before we actually find out if any of this Moto X talk is right, but Google is have a little breakfast get together tomorrow where Android 4.3 is expected to break cover and it could give us some clues.